What an amazing fall weekend! Although cold, Hitomi and I went out for the weekend to Lopez Island. It's known as a premier cycling destination in Washington, due to its low traffic, amazing views, though admittedly not so big and the somewhat recently chip sealed roads make it a bumpy ride for those with skinny tires. Lopez Island has some pretty amazing off-road exploration potential. There's cliffs on the south end of the island. Although I've been there many times, I've always found someplace new to hike to. 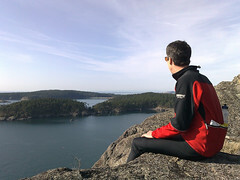 In the photo, I'm overlooking Hughes Bay: If you bicycle to the end of Huggins Road and through someone's private gate, there's a road that leads up to what's probably BLM land, but who knows? There's a number of fire rings and what looks like an old road at the top. I'm not sure who owns the land but it's not developed. I wish I got some pictures of Hitomi, but she's usually at the other side of the camera. This time she just had her phone camera, which has high resolution but fairly poor quality. We stayed at the Lopez Resort and I'm guessing only one or two other guests were there with us. It was the off season, but still I don't know who wouldn't want to be out cycling. This entry was posted in Uncategorized and tagged cycling, lopez. Bookmark the permalink.